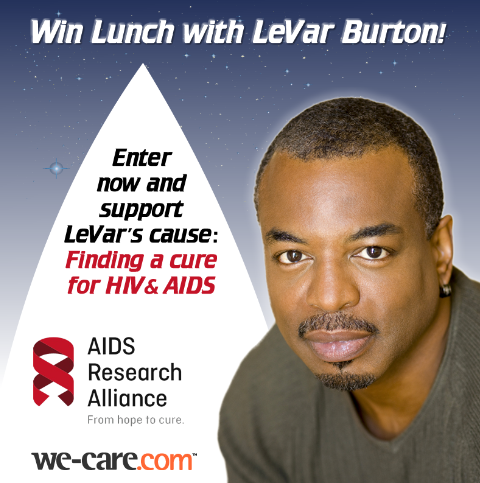 The AIDS Research Alliance is sponsoring a contest right now to win a lunch and photo opp with Star Trek: The Next Generation star LeVar Burton. If you are interested in participating in this promotion, you can sign up for the contest here. I have entered the contest, myself, for two reasons. First, I'm a big fan of Mr. Burton's performances, going way back. I enjoyed his work not only on Star Trek, but Reading Rainbow, Captain Planet, and Roots. And secondly, if I get the opportunity to share lunch with LeVar Burton, I plan to discuss with him how Star Trek: Into Darkness (2013) is actually an allegory for the post-War on Terror Age, and therefore not a betrayal of Gene Roddenberry's vision, as I've heard him describe the sequel. All kidding aside (because, in fact, I really do want to discuss this with LeVar Burton...), this contest supports a wonderful cause -- the search for a cure to AIDS -- and who wouldn't want to break bread with the man who so vividly brought to life Geordi La Forge?